Marlborough Fine Art, London (no. XLOL 3450). A.H. Klihm, Munich, by 1967, and thence by descent to the present owner. New York, The Solomon R. Guggenheim Foundation, László Moholy-Nagy Retrospective, May - July 1947. Oakland, CA, Mills College Art Gallery, Bauhaus, April - May 1940, no. 57. Eindhoven, Stedelijk van Abbe Museum, Moholy-Nagy, January - March 1967, no. A34; this exhibition later travelled to The Hague, Gemeente Museum and Wuppertal, Von der Heydtmuseum. Stuttgart, Kunstgebäude, Wurttenmbergischer Kunstverein, The Bauhaus, 1968, no. 23. Chicago, Museum of Contemporary Art, László Moholy-Nagy, May - July 1969, no. 29. Basel, Galerie Liatowitsch, Die gegenstandslose Welt, 1924 - 1939, February - March 1972. Mannheim, Städtische Kunsthalle, Kunst + Dokumentation László Moholy-Nagy Z IX, 1924, December 1982 - January 1983, no. 32. On long-term loan to the Hamburger Kunsthalle, from 1971 to 2006. 'I became interested in painting with light, not on the surface of the canvas, but directly in space. Painting transparencies was the start. I painted as if coloured light was projected on a screen, and other coloured lights superimposed over it' (Moholy-Nagy, quoted in exh. cat. L. Moholy-Nagy, Arts Council of Great Britain, London, 1980, p. 36). While living in London between 1935 and 1937, Moholy-Nagy kept in contact with his Bauhaus colleague, mentor and friend, Walter Gropius. The stated goal of the Bauhaus had always been to promote 'a new unity of art, science and technology in the service of humanity'. It had always, in fact, been Moholy's practice to adapt his work to, and to adopt the latest industrial technologies. It was part of his life's work to try to integrate the role of the artist, engineer and industrial pioneer. It was primarily for this reason that his paintings were given letters and numbers for their titles, in order, as he once put it, to make them seem more like 'cars, airplanes, or other industrial products' that had rolled off a production line (ibid.). 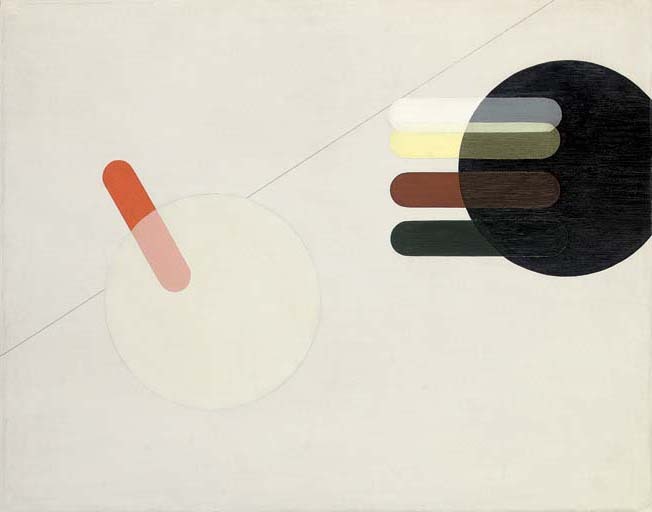 It was in 1936, the year that both LII and LK IIII were painted, that Moholy-Nagy was asked to design the sets and special effects for his fellow countryman Alexander Korda's film, Things to Come. Moholy treated the project as a three-dimensional extension of his pictorial experiments with light, space and movement, creating an assemblage of bright, almost ethereal structures and kinetic sculptures of transparent materials. These not only recalled Moholy's paintings but also his ongoing preoccupation with his plastic creations, the so-called 'space modulators' (see SRhO 1, 1936, sold at Christie's, London, 8 February 2005, lot 371).